Yesterday about two hundred students and other protesters staged a sit-in at the Rose Art Museum, reports the Boston Globe, which has been following the story closely since Monday. A Facebook group and a website, established this week shortly after the news of the closing, played a major role in rallying students and support. The Boston Globe also presents some of the larger issues surrounding Brandeis University’s finances. Modern Art Notes has published an general email sent by Brandeis president Jehuda Reinharz to those who wrote to him. In it Reinharz gives a few more details about his school’s financial situation. The Justice, the independent student newspaper at Brandeis, and the Wall Street Journal are also looking into this part of the developing story. The Brandeis Hoot also weighs in on the situation, and Emily Leifer of the Justice writes an op-ed about Brandeis’s public image. Art & Education, the academic wing of e-flux and Artforum, republished and emailed CAA’s statement against the closing. The Brandeis Hoot also weighs in on the situation, and Emily Leifer of the Justicewrites an op-ed about Brandeis’s public image. Ford W. Bell, president of the American Association of Museums, has issued a Statement on the Closure of the Rose Museum at Brandeis University. Read it at the Boston Globe’s Exhibitionist blog. Artinfo.com has published the response from the Association of Art Museum Directors. The Association of College and University Museums and Galleries, a CAA affiliated society, has published its statement, ACUMG Responds to the Closure of the Rose Art Museum, Brandeis University. Also as reported in the Boston Globe, the president of Brandeis University, Jehuda Reinharz, said that while he would not reconsider closing the museum, he is entertaining the possibility that his school might not sell the Rose Art Museum’s art collection and reaffirmed that the museum building would become a “fine arts teaching center with studio space and an exhibition gallery.” CAA notes that the Rose Art Museum as it stands now is already this. Other updates and articles can be found at Bloomberg.com, the New York Times, and Modern Art Notes, including a Q&A with Michael Rush, director of the Rose Art Museum. Time also interviewed Rush on Tuesday, and Lee Rosenbaum at CultureGrrl has additional information. Donn Zaretsky at Art Law Blog is also writing about the Rose situation, with deaccessioning in mind. The College Art Association (CAA) was shocked and dismayed to learn of the decision by Brandeis University to close the Rose Art Museum and sell its entire art collection for operating revenue. The closing of the museum at Brandeis will be devastating to the academic community, not only affecting our colleagues at the museum and students and faculty in the Department of Fine Arts, which offers programs in both studio art and art history, but also depriving the entire arts-loving public in New England and around the world. The teaching of art and art history in higher education is untenable without the direct study of physical works of art, and it appears the Brandeis Board of Trustees has disregarded the kind of scholarship and creativity that have been the hallmark of CAA members for nearly one hundred years. According to news reports, neither Brandeis University nor the Rose Art Museum is on the brink of economic collapse, nor are they unable to maintain the collections. Given that no clear explanation has been offered on the school’s financial exigencies, the closure of the Rose Art Museum and the sale of its collection appear to be in violation of professional museum standards and of academic transparency and due process; the decision also demonstrates a lack of academic responsibility and fiduciary foresight. We appeal to the Trustees of Brandeis to revisit and reverse their decision. Download a PDF of this letter from the CAA website. What would a trip to Tinseltown be without taking in a few films? During the upcoming CAA Annual Conference in Los Angeles, a pair of excellent documentaries on contemporary artists will be screened. 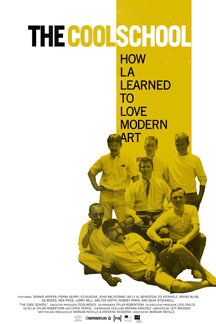 Join us at REDCAT: The Roy and Edna Disney/CalArts Theater (REDCAT) in downtown Los Angeles for a screening of The Cool School, a documentary about how a few renegade artists built the Los Angeles art scene from scratch. The principal cast includes: Ed Ruscha, Dennis Hopper, Frank Gehry, Billy Al Bengston, Irving Blum, and Robert Irwin. The film’s director, Morgan Neville, will be on hand for a Q&A session after the film. The screening of The Cool School will take place on Thursday, February 26, from 7:00 to 9:00 PM. Tickets are $15; space is limited. Tickets can be purchased by calling CAA Member Services at 212-691-1051, ext 12., or in the registration area at the Los Angeles Convention Center only; they cannot be sold or purchased at REDCAT. Produced and directed by Jeffrey Perkins, The Painter Sam Francis, a feature-length film portrait of the artist Sam Francis (1923–1994), portrays his entire life and professional career. Forty years in the making, the film shows the artist at work in his studios from 1969 to 1992; it also includes interviews with the artist, his family members, art historians, and artists such as Ed Ruscha, James Turrell, and Bruce Conner. The film is an intimate portrait of an important artist at work, as well as an personal view as told by the artist himself and those that knew him. The Painter Sam Francis will be screened on Friday, February 27, and Saturday, Febru-ary 28, 12:30–2:00 PM, in the Ahmanson Auditorium at the Museum of Contemporary Art, Los Angeles; admission if free. Geoff Edgers and Peter Schworm of the Boston Globe reported yesterday that Brandeis University, a private research university in Waltham, Massachussets, plans to close the Rose Art Museum and sell its collection of modern and contemporary masterworks. The measure to shutter the museum, which was founded in 1961, in late summer 2009 is one of several drastic decisions the school is making as it faces a budget deficit of several million over the next couple years. “The decision to shut the museum,” writes Scott Jaschik of Inside Higher Ed, “runs directly counter to the ethics codes of art and museum associations, which permit the sale of art donated for a museum only for the purchase of additional art, not to be shifted to other purposes.” The Association of College and University Museums and Galleries, a CAA affilated society, has already spoken out opposing the closure. Relatedly, Inside Higher Ed also reports on shrinking college and university endowments. CAA recognizes the lives and achievements of the following artists, scholars, designers, architects, philanthropists, and collectors. New editions of CAA’s two Directories of Graduate Programs in the Arts are now available for purchase. Listing more than six hundred programs in the United States, Canada, the United Kingdom, Australia, New Zealand, and elsewhere worldwide, the guides are the most comprehensive resources available for prospective graduate students in the visual arts. Colleges, universities, and independent art schools are all included. 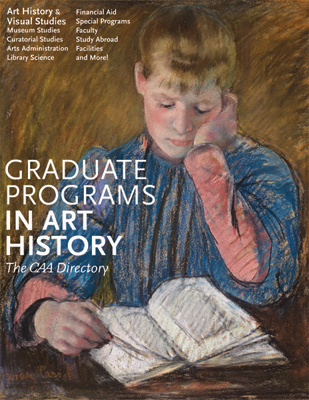 The first volume, Graduate Programs in Art History: The CAA Directory, includes over 260 programs that offer a master’s, doctoral, or related degrees in art and architectural history, visual studies, museum and curatorial studies, arts administration, library science, and more. 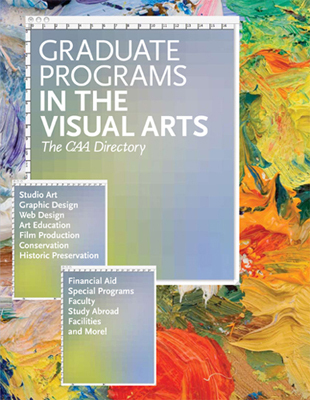 The second book, Graduate Programs in the Visual Arts: The CAA Directory, describes 350-plus programs that offer a master’s or other advanced degree in in studio art, graphic and web design, art education, film production, conservation, heritage preservation, and more. Compiled in 2008 and conveniently divided into two separate volumes, these easy-to-use directories present detailed information on: descriptions of special courses; numbers, names, and specializations of faculty; facilities such as libraries, studios, and labs; student opportunities for research and work; information on financial aid, fellowships, and assistantships; and details on housing, health insurance, and other practical matters. An index lists schools alphabetically and by state and country for quick reference. An introductory essay presents a detailed description of the elements of a program entry, including explanations of the various kinds of programs and degrees offered, placing the search and selection process in context. Although these invaluable books are designed primarily for students who are considering graduate study in the arts, they also provide a wealth of data for academic departments and programs, researchers, publishers, and funders. Each directory is available for $39.95 for members and $49.95 for nonmembers, plus shipping and handling. Please visit CAA’s online store to get your copies of the directories today! Please note: If you are ordering on behalf of an institution of department within a university, please use this special order form (or request one from Anitra Haendel, CAA office services and purchasing coordinator) and submit it via fax or post. At this time, online purchases can only be processed for individuals.